Corruption between government and the bankers is nothing new. During the 4th Century BC, money that was donated to the gods became the temple treasure. Typically, the government would borrow from this hoard of cash and thus temples emerged as bankers. In Athens, there was one of the early banking crisis events involving what we would call the Secretary of the Treasury so to speak and his banking friends. While there may be some parallels to Hank Paulson helping Goldman Sachs during the crisis of 2007-2009, the events that took place are different, while the ethics are probably very similar. The Temple kept its donations in the Opisthodomos. The Temple was not earning interest on its hoard of cash. The treasurer agreed to lend the money to personal banking friends who would then pay the treasurer interest that he could then personally put in his pocket. When the banking crisis hit and there was a liquidity problem, the banks could not repay the loans to the Temple. Demosthenes (384-322BC) tells us that banking transactions were completely confidential in Athens. He tells us that the rich could “conceal [their] wealth .or in order that [t]he[y] might obtain secret returns through the bank.” Dem 45.66. The banker Aristolochos was said to have taken substantial deposits and owed many a significant amount of funds (Dem 46.50). The bankers Sosinomos and Timodemos failed with many others and were unable to meet demands for withdrawals (Dem 36.50). With a banking crisis in full bloom, now the treasurer was exposed. To try to cover-up the scandal, they set fire to the Opisthodomos. Nevertheless, the scheme was detected and the Treasurers of Athena were seized and imprisoned, about 377-376BC. In 1989, government ministers of Crete pulled the same scam. They were depositing government funds in the Bank of Crete and interest was being diverted to themselves. It was the failure of the Bank of Crete that exposed the scam (See NY Times, 9/21/89, A14; 9/27/89, A3). Aristolochos’ bank failed it appears due to real estate prices collapsing, (Dem 36.50). Then the bankers failed, all of their funds and property were seized. What is interesting is that Demosthenes warns his fellow Athenians of the dire consequences for all of Attica ~hould the banker Phormion be forced into bankruptcy. “Don’t throw [him] away! Don’t allow this piece of filth to bankrupt him!” (Dem 57-58). What Demosthenes sees in the midst of one of the earliest banking crisis in all recorded history, is that the lending of money was clearly a leverage that indeed had supported the entire economy. The drop in real estate in ancient Athens is not unlike that of the 2007 crisis. The deep corruption on the part of the Treasurer is something that sets off a public crisis in the collapse of confidence in banking. Demosthenes does make it clear that the people should be angry at the bankers who failed (Dem 49.68). Reading between the lines implies he is trying to counsel the people that they should not panic and then withdraw their funds from all bankers. They should be justly concerned and outraged by the bankers who have failed, but do not by any means attribute that to all bankers. These are words that have been repeated countless times in the midst of every panic throughout every century. They are repeated once again today, with record huge bailouts. 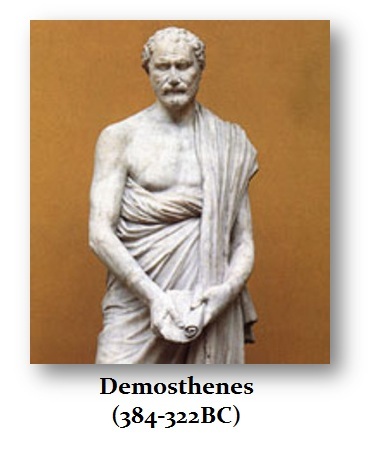 Demosthenes focuses on the individuals and tries to dispel the CONTAGION that was then spreading throughout the entire economy. serious accounts. The 370BC decade was one of a major Athenian banking crisis that seems to have involved government officials that should come as no surprise. saw the problem that demand would rise and fall and sometimes exceed the supply without just cause. Athens was making a transition from a predominant agrarian society to one of trade that included manufacture and finance. He called this the “monied mode of acquisition” that was driving the economy fed by businessmen concerned purely with profit that he described as “making money from one another.” The predominant economy was the villa that produced and consumed what it planted. 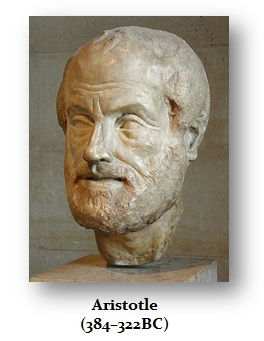 Thus, his Politics (1256a-1257b) was describing the changing economy as Athens was rising as an economic power. The old “oikos” had been this model of a self-sufficient, producing for its private consumption was fading. By the time we reach the 4th Century BC, agriculture is being raised and sold for cash. This, no doubt, caused land prices to rise. As people could now sell their crops for export, suddenly land prices would have now increased in value. This was one of the earliest bubble events in real estate that naturally resulted in a banking crisis no different from we have seen today and even in terms of the DOT-COM Bubble. Prices will always rise to reflect EXPECTED potential earnings, and then reality sets in. Hence, history repeats because the passions of man simply never change. 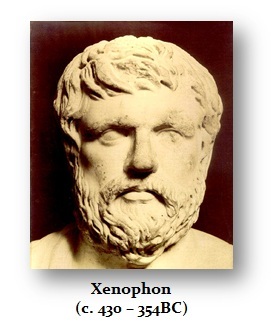 Xenophon (430-355BC) wrote his major work Oikonomikos (how to regulate the household = ECONOMICS) touting the virtue of the estate and a self-sufficient system. But by 355BC he had reversed himself in Poroi and . 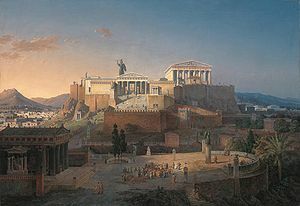 now promoted a market economy, encouraged immigration for labor, and to increase the m~ney supply that was raising the living standards of all Athenians. There is little doubt the banking crisis is far from over. This is merely the pause between storms. Most pension funds and banks rely upon government debt. Because we are in the midst of a sovereign debt crisis, we are in very serious trouble. The banks that typically will get hit the worst are in fact those engaged in trading. The merchant banks throughout history will be hit so hard that there will be no time to run. They will simply fold in the middle of the night. No matter how much political clout they may have behind the scenes, it will not help. Throughout history, those bankers who always go down in flames and have destroyed the economy to varying extents, have always been those who are traders. They are also touted as the best, brightest, and richest. However, these laurels are often short-lived. Today we have Goldman Sachs who has pursued political control no different from all the famous merchant bankers before them. The one firm that was on top of the world was indeed Solomon Brothers. They were king of the hill and Goldman Sachs yearned for their power . from the shadows. The downfall of Solomon was linked to the collapse in commodities when gold crashed from $875 to under $300 between 1980 and 1985. The some 6,000 bank failures of the Great Depression had a common theme. They were speculating and trading. That was the entire purpose of the regulations that had separated banks, brokers, and insurance. It was former Chairman of Goldman Sachs Robert Rubin who worked to repeal that in 1992 that has enable the economic crisis to unfold by blending trading, banking, and insurance causing the bailout of AIG. These events are by far nothing new. We have banking crisis after crisis from ancient times through medieval, which all have the same root cause – trading and corruption of government.